Online blackjack certainly was an impressive venture for online casinos all over the world. However, most casino game lovers desired for much more in terms of more realistic and more social blackjack gaming experience. And so, live blackjack was born with the help of high-definition video streaming technology that allowed real dealers to be broadcasted while dealing the cards in real time. The social aspect was implemented so well that players were allowed to chat with each other in the course of the game. Online blackjack is no longer limited to the virtual realities where the odds of the game are dependent on a computer. Instead, it has evolved into an authentic and convenient casino experience with more perks including extensive accessibility that was limited by the ordinary online blackjack and the land-based casinos. Other than the authenticity it offers, the game provides plenty more merits over ordinary online blackjack. These range from auto-generated tables which guarantee you a spot at a blackjack table of your choice, to the multi-hand gameplay that is powered by a split screen feature. Also, unlike traditional blackjack and ordinary online blackjack, players are allowed to choose the dealers they prefer. Understanding the rules of blackjack is very critical to implementing a proper blackjack strategy. Also, just as important is the need to understand the fact that blackjack rules may vary from one online casino to another and as such, you blackjack strategy should cut across the rules and guidelines outlined for each and every online casino you wish to play at. Depending on the online casino you are playing at, blackjack usually means you win 1.5 the amount of your bet. Doubling is a hit, only the bet is doubled and you only get one more card. The split can be done when you have two of the same card – the pair is split into two hands. After splitting, each of the new hand is worth the same amount as the original bet, effectively doubling the bet amount. You can only double/split between the first move, or first move of a hand created by a split. You cannot play on two aces after they are split. You can double on a hand resulting from a split, tripling or quadrupling you bet. There are of course more comprehensive outlines of the rules that detail every aspect of online blackjack. In many cases, online casinos have documentation pages that outline them quite clearly. Like we said before, the rules may vary so it is advisable that you get acquainted with the rules and guidelines of the online casino you choose to play at. 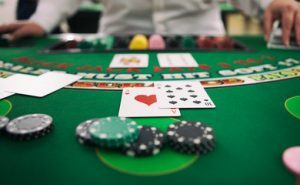 On entering the real dealer’s lobby, players have the option of picking whichever table and seat they wish to occupy after which they place their bets on a virtual board in front of the real dealers just in a traditional casino. The hands are timed to ensure that all players place their bets efficiently. The players are allowed to hit, stand, double down or split while playing live blackjack online which gives the authentic feel of playing at a land-based casino. In cases where the rules allow it, players are allowed to employ any black strategy that may require them to buy insurance on their bets or if need be, surrender them. Blackjack always pays 3 to 2, remember that. Golden Nugget’s live online blackjack tables, for instance, are played with eight decks of cards which are always cut in the middle and are always shuffled by the real dealer at the end of each round. Unlike ordinary online blackjack where players play against a computer, live blackjack online allows players to place side bets. A perfect pair, colored pair, and mixed pair are allowed variations of perfect pair payout side bets that apply in Golden Nugget. Live online blackjack has a return to player (RTP) percentage of 99% for perfect play blackjack, 95.91% for a perfect pair, and 93.72% for 21 +3. One overlooked tip for live blackjack is usually about insurance. It is advisable not to place insurance on the bets since more often than not the advantage always lies with the casino. If you have to take the insurance then an equally advantageous blackjack strategy needs to be adopted. One such blackjack strategy can be implemented when the dealer’s face up card is a 10. The player can take the insurance which implies that it is an independent side bet of the main wager that the dealer has 21. This blackjack strategy nearly always assures players of receiving two dollars for every dollar. You can also take insurance if you have a 21 which allows you to win the 2:1.